The Parkway is a fast-growing senior community with an engaging environment. We encourage independence and offer a variety of services and features to suit your lifestyle. The Parkway Senior Living Community in Blue Springs, MO is the perfect place to enjoy more, worry less and embrace the good things in life. Our staff provides friendly, personalized service so residents are assured that their daily needs are met. Apartments are designed for safety, comfort, and privacy, and decorated with your own furniture and belongings, to feel like home. With Independent Living, Assisted Living, and Memory Care options, The Parkway has something for everyone ages 55+. The health and well-being of residents are the top priorities of The Parkway team. We coordinate with residents’ own healthcare professionals so every element of daily life is considered. If you’re looking for a welcoming, enjoyable and expertly managed senior living community, please contact The Parkway Senior Living team for more information today! 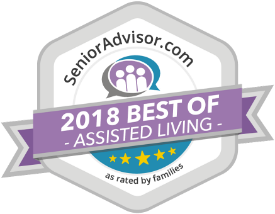 The Parkway is a proud recipient of the 2018 Senior Advisor Best of Assisted Living Award from SeniorAdvisor.com. Private studio apartments in the comfortable Memory Care neighborhood gives residents their own space while providing a secure, homelike environment to ensure their comfort. Residents receive a higher level of attention and companionship from caregivers, while events are tailored to specific preference and sense of purpose. The residents of the Parkway and their families can rest easy. Our apartments are designed to be senior-friendly and no matter the day or the hour, assistance is always on hand to ensure your safety and peace of mind. The Parkway Senior Living has constructed its continuum of care community concentrating on attributes of decency, integrity, and quality of life. Our villas, apartments, and community spaces have all been crafted with the aging process in mind to provide easy maneuverability, ensuring comfort and safety. With a team that has a passion for senior care, each employee of The Parkway Senior Living will you treat you with respect and offer service with a smile. Our staff works closely with your physicians to confirm that your daily needs are appropriately addressed, which will provide you with the highest level of independence. The Parkway Senior Living values every lifestyle within our community, from Independent Living to Assisted Living to Memory Care, by pledging detail-oriented services that are unrivaled. Every inch of the grounds at The Parkway has been designed as an extension to your private living space, where you can host family and friends. With daily, weekly, and monthly events, every day at The Parkway will offer enriching experiences for you to enjoy. Check out the latest flick in our theater or relax at the Le Soleil Salon. You can't go wrong with the many activities offered to our senior community. Health and well-being are the top priorities at The Parkway in Blue Springs, MO. With pursuits that boost activity, our residents remain active mentally and physically to retain the highest level of wellness possible. Our LifeTrail equipment was designed specifically to tailor to the needs of seniors. Each of the outdoor stations encourages exercise by engaging routines that can be completed at one's own pace. If indoor exercise is preferred, we maintain an all-inclusive fitness suite with familiar equipment. Yoga, aerobics, strength training, and tai chi group classes are also available for any resident that enjoys a more social environment. For mental stimulation, our occupants enjoy reading new books and novels in our library or challenging friends with brainteasers. There is no shortage of mentally and physically rousing opportunities at The Parkway Senior Living. Reserve your spot at The Parkway Today!